Fortnite Season 6 Trailers Show Some Changes to the Game and Map | Nerd Much? As Fortnite Season 5 was coming to a close, we followed the adventures of Kevin the Cube as he made his way across the Battle Royale map before finally making it to his final destination of Loot Lake. Kevin the Cube then climactically entered the lake, transforming the area into a glorified bounce house. The fun was short lived, because as seen in today’s Fortnite Season 6 trailers, things are now radically different at the lake house. Epic Games dropped the above cinematic trailer earlier this morning with the launch of Fortnite Season 6. 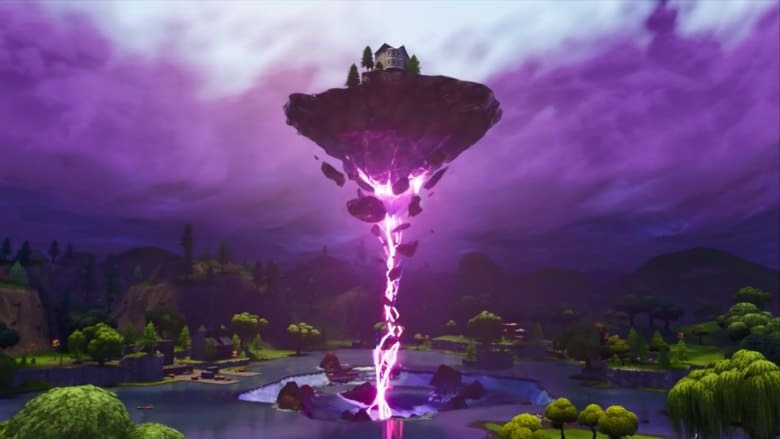 In fun fashion, it shows Kevin the Cube’s next maneuver after transforming the lake – lifting the lake house at its center entirely from the ground and high into the air. It’s now dubbed by Epic as the Floating Island. There are few other radical changes to the overall Season 6 map too. There’s now a massive Haunted Castle, a Corn Field area, and there are sections known as Corrupted Areas that contain a new consumable called Shadow Stones. Using a Shadow Stone will put your character into Shadow Form. While in Shadow Form you can’t use weapons, but your character is rendered completely invisible while stationary. However when you do move you are more visible than normal and leave behind a trail. Also while in Shadow Form you’ll have the ability to Phase. By pressing the trigger button you’ll be thrust in the direction you’re looking and can pass through objects too. Shadow Form lasts 45 seconds for each time consumed, but can be exited early by holding the aim button. Fortnite Season 6 is now live within the game. Hop in and explore the new map, go Shadow Form, and find a new pet to be your BFF in this battle royale. If you’re at work though (like me), these Fortnite Season 6 trailers will have to do.